Word Cloud: Who Am I? I recently attended a session at ProductCamp by Marc Miller of Career Pivot about how to maximize your professional brand on LinkedIn. 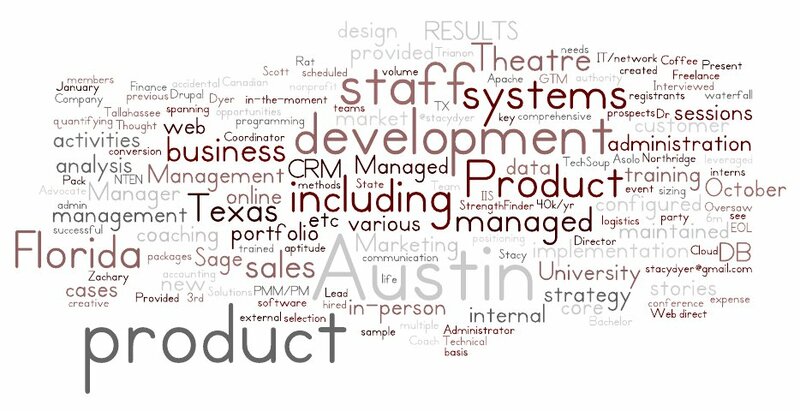 One of the techniques he recommends is to create a word cloud of your resume so you can easily see what key words stand out. Just for fun, here is mine! I used wordle.net to create mine. Words are important. Regardless of whether you are marketing yourself or your product, drifting too far from the core focus dilutes your message and bores your readers. Worse than that, when writing for publication online, in the the world of SEO and Google-bots, having too many of the wrong words could translate to attracting the wrong audience altogether. Word clouds can be a fun way to visually see the most frequently used key words and ensure your writing stays on target. What does yours say about you or your product? This entry was posted in Product Marketing and tagged marketing, PCATX, writing on February 25, 2013 by stacydyer. I just stumbled upon your blog post. I hope you are still enjoying working with word clouds! Thanks, Marc! It was a fun experiment! As you can see, I added a tag cloud to my blog as well. I enjoy catching up on your posts every Sunday too. Keep up the great blogging!